Wingko, which is sometimes called Wingko Babat, is a traditional Javanese pancake-like snack made from grated coconut, sugar and glutinous rice flour. The most famous wingko is made in Babat. 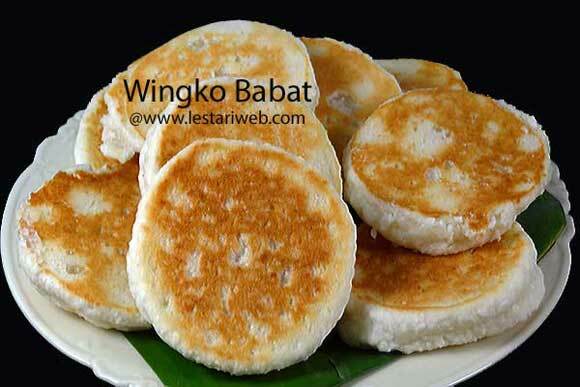 As its full name, wingko babat is originated in Babat, a small regency in Lamongan, a municipality in East Java Province. This is the proud of Lamongan city beside their famous Soto Lamongan. Wingko is popular especially along the north coast of Java island. It is sold mostly by peddlers on trains, at bus or train stations, or in dessert and cake shops. Important Tips: Although many recipes of reference books and internet may suggest that small Wingko Babat pancake can be made by baking it in the oven without problems, my advice is just ignore this idea! 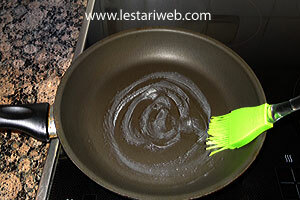 I recommend you strongly ;-) to use the conventional way by heating on the skillet/non stick pan as I show you on this recipe. By baking them in the oven, you won't get Wingko Babat Pancake which tender inside but it turns out to be rubber-band alike coconut cookies which's hard out and inside! Believe me, because I've done 2 times experiments with 2 different temperature variations and the results remain the same! Stoned Grated Coconut Cookies ha ha ;-). Grate coconut lengthwise if you use fresh coconut. (Skip this step if you use desiccated coconut & coconut milk mixture). 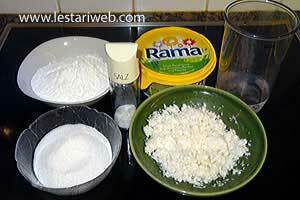 If you use desiccated coconut, add the coconut milk on it and stir to mix until the coconut becomes moisted. 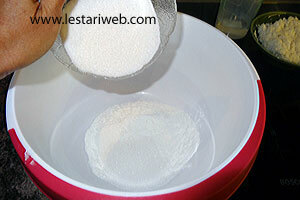 Mix the glutinous rice flour and sugar in a large bowl. Stir to mix. 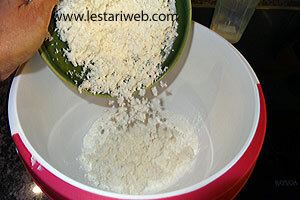 Add the grated coconut or moisted desiccated coconut, stir once again. Add coconut water or warm water, add little water at times and knead with the hand or wood spatula to get smooth, a rather sticky dough which can be shaped. Adjust the taste, if necessary, add sugar or salt to taste. Divide the dough into 20 equal portions. Take one portion of dough, form a ball shape (with a diameter of approximately 5 cm) by twisting the dough between the palms of your hands. 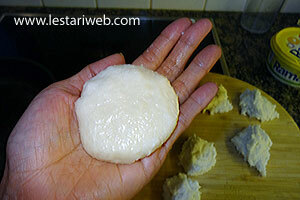 Then press the dough ball with your fingers to make a flat round shape with a thickness of 1.5 cm. Put aside. (See the picture). Put a non stick pan or skillet (diameter 25 cm/10 inches) over medium (scale 4.5 from 9) and lightly grease with small amount of butter/margarine. 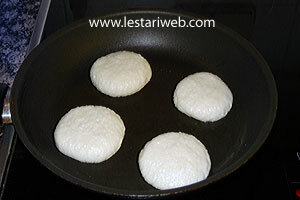 (Important: The stove should not exceed the medium heat because the dough is quite sweet. 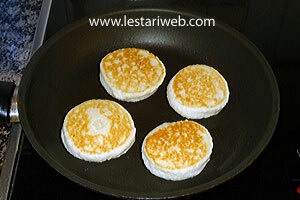 By high heat the pancake will burn outside but not cooked inside!). Turn it over with the kitchen tool or wide spatula & let it cook for another 5-6 minutes until the both sides are well cooked. Serve hot or cold. 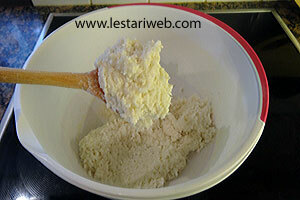 Add a little water at times, do not apply all at once, otherwise the dough will be too soft. The water content from glutinous rice flour and grated coconut affects the moisture consistency and the addition of water may vary. If the dough is too soft already, add the glutinous rice flour as necessary. This pancake dough is indeed rather sticky and little bit soft, so do not add too much flour otherwise the pancakes will be too hard.